"The good of the people is the greatest law." The Law Offices of Thomas E. Elenbaas, Inc., is a civil practice law firm emphasizing business and real estate litigation and transactional matters, landlord-tenant law, and general civil litigation and appeals. We are located in the City of Fullerton, Orange County, California. Mr. Elenbaas brings 40 years of business law experience to the table, enabling him to provide high quality legal service while at the same time maintaining a commitment to cost effective representation. As a sole practitioner Mr. Elenbaas is able provide each of the firm's clients with the personal attention their matters deserve. We primarily handle lawsuits and transactional matters in metropolitan Los Angeles, Orange, Riverside, San Bernardino and San Diego Counties, but also practice in all State and Federal courts in California. Our clients have included companies from throughout the United States. © THOMAS E. ELENBAAS, INC. The material on this website is provided solely for general information and is not intended to, and does not constitute, legal advice. This website is not an offer to represent any visitor to the site, and contact with this site or any attorney or employee of the firm (by e-mail or otherwise) does not establish an attorney-client relationship. 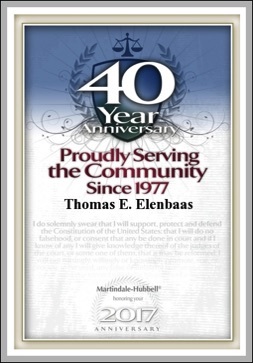 Thomas E. Elenbaas, Inc., is a law corporation organized in the State of California. This website is not intended to seek professional employment in any other state, nor is it intended as advertising or solicitation in any jurisdiction where the site would fail to comply with all applicable laws and ethical rules of that jurisdiction.